New Delhi: “Palestine has been reduced to an issue of charity among the Arab and the non-western countries. For Arab states, their own survival becomes more important as they are aware that a perpetual conflict with Israel will lead to the collapse of their own legitimacy” said Dr Omair Anas, Assistant Professor of International Relations, Ankara Yildirim Beyazit University, Turkey in a ‘Disquisition’ at Abul Fazal Enclave, Jamia Nagar. 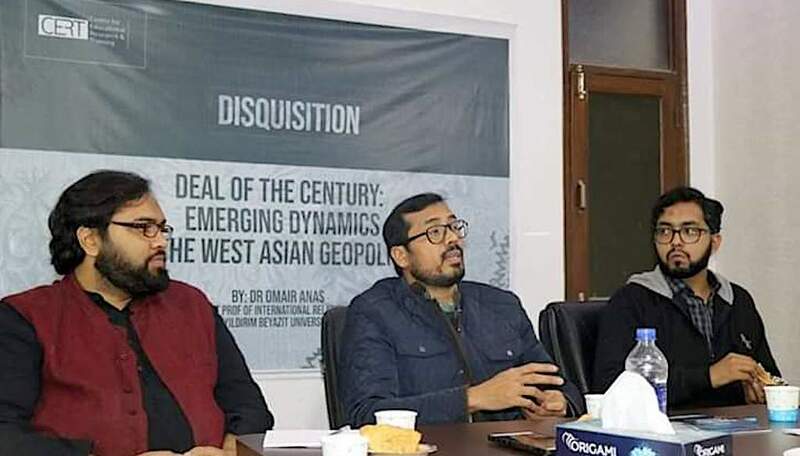 Dr Omair Anas was invited to speak on the topic ‘Deal of the Century: Emerging dynamics of the West Asian Geopolitics’. The event was organised by the Centre for Educational Research and Training (CERT) and IndoPal Foundation. Syed Muzakkir, the Director of CERT introduced the aims and objectives of CERT to the audience and welcomed the speaker. While drawing the historical background of the whole Middle East region, Dr Anas talked about Iran being the centre of the power-conflict in the region. “In his speeches, he repeatedly said that the Arab states are the puppets of western democracy. In order to provoke Arab states, he adopted pro-Palestine rhetoric. This way, Iran emerged as a threat against Israel”, explained Dr Anas. According to Dr Anas, there was some hope with the emergence of non-western countries, and they were expected to create a new international system which believes in equality and justice and would challenge NATO. “But since Israel’s military capability has become a compulsion for Arab states, their own survival becomes more important to them. This is also true that like the Arab states, these non-western countries also betrayed the Palestinian cause eventually and hence the Palestinian issue has now become an issue of charity” added Dr Anas.